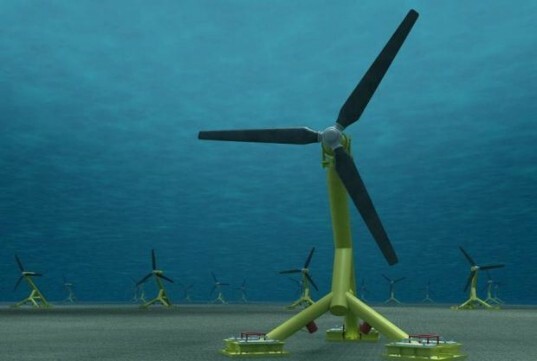 Tidal farms, which use underwater turbines to harness the power of the planet’s oceans and convert it into electricity, are something that we frequently mention here at Inhabitat. While there are plans to build them all over the world, Scotland achieved a major milestone this week by successfully installing a 10MW tidal power array in the Sound of Islay, off the coast of Orkney. This week saw the successful installation of a 100-foot-tall subsea turbine. After it was installed, tests were conducted to generate electricity for the surrounding region. Scottish Power Renewables, which is overseeing the project, said the turbine was performing well and is already powering homes and businesses on the island of Eday. It wasn’t an easy installation, as the 1-megawatt Hammerfest Strom HS1000 turbine was lowered into the sea during a storm, with crews facing hostile waters (see a video of the installation here). However, successful tests will pave the way for future turbines. “We have already greatly developed our understanding of tidal power generation, and this gives us confidence ahead of implementing larger scale projects in Islay and the Pentland Firth,” Anderson said. “Scotland has the best tidal power resources in Europe, and that’s why we are seeing world leading technologies tested here.” The HS1000 tidal turbine can power the annual electricity needs of 500 homes. It is hoped, with the success of this stage, that the project’s timetable will be finalized, and that construction will be completed between 2013 and 2015. All nice and well, but how about marine life protection? These turbines look very dangerous compared to the round ones with the hole in the middle (in France, I think...). I wouldn't invest in an 'ecological' project that neglects the impact on the lives of the creatures living there. Username already registered fine but why delete the comment why not hold the comment until I furnish another? Now its great that we are having the world wanting to invest in Scotland no matter what politicians say. Tidal farms, which use underwater turbines to harness the power of the planet's oceans and convert it into electricity, are something that we frequently mention here at Inhabitat. While there are plans to build them all over the world, Scotland achieved a major milestone this week by successfully installing a 10MW tidal power array in the Sound of Islay, off the coast of Orkney.